Editor’s Note: This post is sponsored by Framebridge as the frames featured in this post were sent to me complimentary by the brand in exchange for me writing about them. The prints featured in this post were sent to me complimentary as part of this prior post. All editorial and opinions are my own. This post does contain some affiliate links which means I’ll earn a small commission if you shop through them. Since our recent move to a new house, I’ve been busy working on figuring out spaces, deciding what works where and shopping for new decor and artwork. After acquiring two new gorgeous art prints (which were featured in the recent Valentine’s Gift Guide), I was looking forward to having them framed and hung to be properly enjoyed. I had worked with Framebridge a few years ago and had a wonderful experience so I was excited to partner with them again to have these beauties expertly framed and share the process with you. The last time I partnered with Framebridge, I simply uploaded my photos directly to their website, chose frames and mats, and about a week or so later, they arrived at our doorstep ready to hang. I never even had to leave the house which was truly a dream come true for a first-time mama in that spacey newborn haze. This time around, I knew I’d obviously have to mail the art prints to the company and I wasn’t sure how smoothly that process would go but I should have known from my previous experience that it would be completely seamless and impressive. Since I had artwork rather than digital photos this time, I snapped a photo on my iPhone of each print and uploaded them to the Framebridge website in order to be able to visually “try on” different frames. This enormously helped me in being able to choose the perfect fit and I also tried different mat colors as well as one versus two mats. Once I chose the frame styles and mats, I placed my order and was immediately sent a confirmation e-mail along with two prepaid shipping labels that I easily printed out at home. 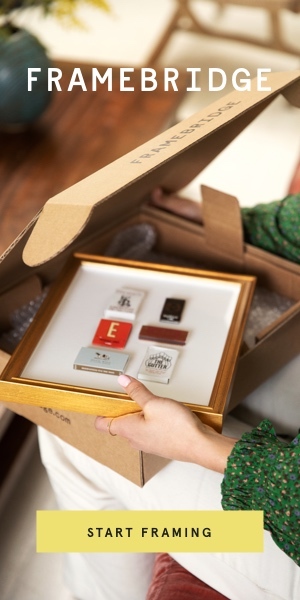 Framebridge gives you the option of mailing your artwork to them in mailers you already have or they’ll send you custom sized mailers at no extra charge. Since I still had the original shipping packages, I opted to just attach the new shipping labels to them and tape them up. The next morning, I dropped them off at my local UPS and was in and out in less than two minutes. I was sent e-mail updates throughout the next week or so letting me know that Framebridge had received my prints, that they were unpacking them and getting started and lastly, that they had finished them up and were getting ready to ship them back to me. I also promptly received tracking updates letting me know exactly when to expect their delivery. And in less than two weeks time, I had received both of the art prints – carefully packaged and beautifully framed. They even included the proper nails and hardware to hang each frame. Basically, Framebridge is true custom framing for the price of not-custom framing which is definitely smile-worthy. I chose the Georgetown frame (antique fluted gold) for my Lemon & Capri Art Print (c/o) by Willa Heart and I am so pleased with it. The warm gold tones and fluting complement the playful print so well. For now, it’s hanging in the living room but I’m toying with the idea of moving it to the powder room to add some unexpected whimsy. Next up, I chose the Jambi frame for the stunning Staffordshire Dogs print (c/o) by Paige Gemmel / Pink Lion Dog. The rich glossy tiger wood frame offers a traditional vibe that pairs quite well with the pups in our formal dining room. I love how the deep glossy burl of the wood plays against our wooden antique pieces in the room – such harmony. I honestly couldn’t be happier with the craftsmanship and the professionalism of this company and I whole-heartedly recommend them if you’re looking to have your wedding photos, mementos or treasured artwork framed. 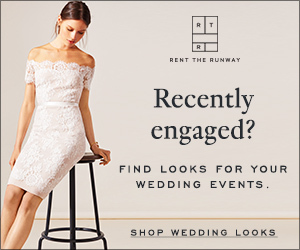 Make sure to check out the wedding shop collection from Framebridge, too.